The fabulous writing duo, Catherine Coulter and J.T. Ellison up the stakes in The Devil's Triangle as Special Agents Nicholas Drummond and Michaela Caine lead their first Covert Eyes mission. Everyone's favorite master thief, Kitsune, aka the Fox, is back and she's asking Nicholas and Mike for help. It seems like a straightforward mission: fly to Italy to rescue the Fox's husband and bring her back in handcuffs. When the crew lands bullets fly and the team finds themselves tracking the most dangerous suspects yet. With every novel written in this series Coulter and Ellison push the envelope more and more. The plots stretch broader and become more complex while running the risk of becoming outlandish, but The Devil's Triangle doesn't completely fall off track. I expected the story to focus on the mystery of the Bermuda Triangle, but that was more on the periphery of a much bigger plot. Five generations of the Koath family have been obsessed with finding Ark of the Covenant. They believe it's their destiny to protect it or use its sacred power to gain eternity. It was quite a stretch for two epic concepts to be melded into this gargantuan plot, but somehow Coulter and Ellison pulled it off. There is quite a bit of info dump throughout the novel, which is one aspect that tempts me to skip through the story, but sets it apart from a regular mystery. The reader is privy to bits of information that's later repeated when the agents figure it out. We're aware of the culprit so there isn't usually an element of surprise as far as 'whodunit'. The surprise element comes from seeing what kind of trouble Nicholas and Michaela stumble upon in the course of their investigation. 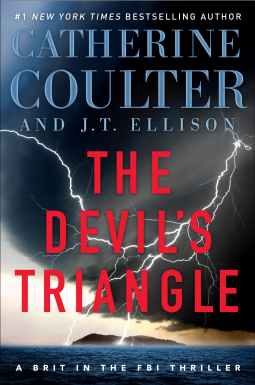 The Devil's Triangle, along with the previous novels in the series so far, is jammed packed with action. From car chases to cliff jumps -- it's all there and you don't want to miss out on an adrenaline packed novel! Even with the nearly non-stop action it still manages to be a well-rounded story. The Covert Eyes team has become my favorite group of people to hang out with. Though Nicholas and Mike have this wild romance blossoming behind the scenes, readers get a peek of their connection as they hunt down criminals together. Other regular agents from the series like Ben Houston, Adam Pearce and Louisa Barry seem to have stronger presences and roles in the story. A Brit in the FBI is truly an ingenious series! It reminds me a bit of Sandra Brannan's Liv Bergen mystery series on an international scale with much more fast-paced action. The characters are sharp, witty, and just a little bit scary as they take on whatever big bad adversaries stand in the way of justice. To Catherine Coulter and J.T. Ellison: keep 'em coming ladies!